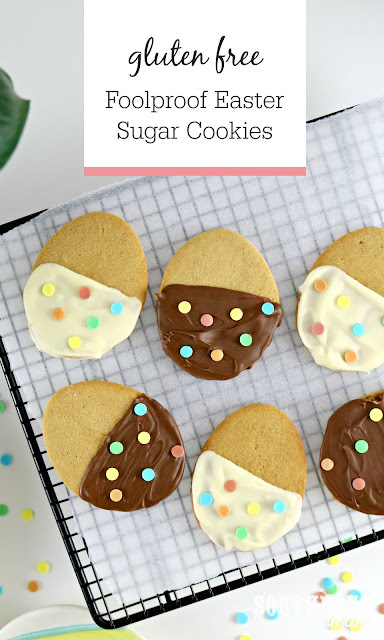 Foolproof Gluten Free Sugar Cookies Recipe for Easter – These cream cheese cut out cookies are so easy to make. Instead of messy frostings, dip them in melted chocolate and add sprinkles for a fun Easter Treat. Perfect for families or sharing with friends, this recipe is so simple even the kids can make them! Great for Easter parties, Valentine’s Day, Christmas or whatever occasion you fancy (just change the cookie cutter!). I always get so excited when Easter is on it's way because it's a season that combines all my favourite things. Whilst it isn't Spring in Sydney, and the weather is getting colder each and every day - Easter means I get to lull myself into a false sense of Spring joy as I surround myself with sweet baby bunnies, tulips and all the stereotypical Spring Easter-y things.... oh and you can't forget the chocolate. Easter and Christmas are my favourite times of the year - Jesus + Good Food + Cute Decor = Happy Kristy. I especially love Christmas time because it means I can make ALLLL the Christmas cookies - but this year, I thought, why not make some Easter cookies? 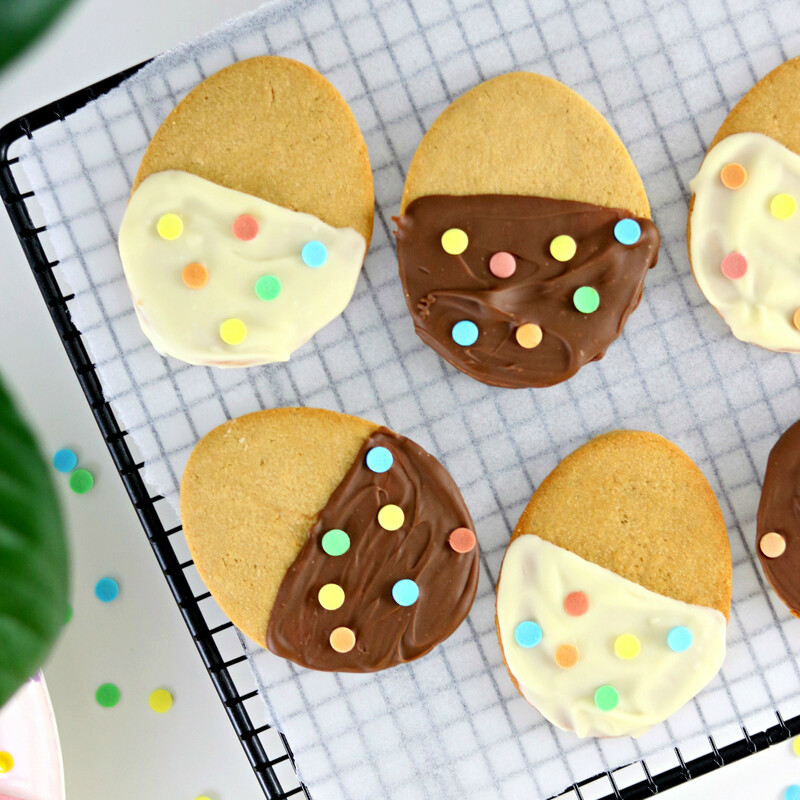 These Easter Egg Cookies are our pick for the Easter season. They are SO easy to make, seriously delicious to eat and perfect for sharing with friends or giving as a homemade gift. If you feel like sugar cookies/cut out cookies are usually a disaster for you, DON'T WORRY! This recipe is pretty much foolproof (as long as you follow it!) and makes cookies that are soft and delicious. The secret ingredient is the cream cheese. It adds so much flavour and turns a boring cookie into a family favourite. Sure, if you're a culinary goddess, you can decorate these with royal icing and get all fancy - but if you're a no-fuss kind of baker like me, the easiest (and most delicious) way to decorate these cookies is to dunk them into chocolate and cover them with sprinkles. But the choice on how you decorate them is totally up to you! 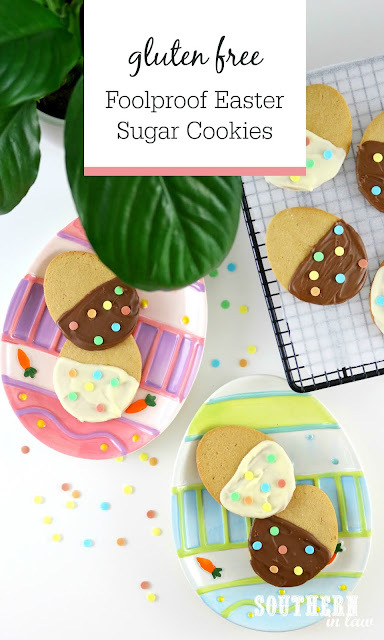 Foolproof Gluten Free Sugar Cookies Recipe for Easter – These cream cheese cut out cookies are so easy to make. Instead of messy frostings, dip them in melted chocolate and add sprinkles for a fun Easter Treat. Perfect for families or sharing with friends, this recipe is so simple even the kids can make them! Great for Easter parties, Valentine’s Day, Christmas or whatever occasion you fancy (just change the cookie cutter!). In a mixer, butter and sugar until light and fluffy, scraping down the sides inbetween mixing to ensure everything is incorporated. Add your cream cheese, vanilla and egg and mix until combined. Add in your sifted flour, cornstarch and salt. Mix until all of your ingredients are combined and a soft dough is formed. Remove your dough from your mixing bowl and place onto a sheet of baking paper. Pat your dough out to form a flat disc and wrap with more baking paper. Place your dough disc into the fridge to chill for 1-2 hours or until firm. Preheat your oven to 180C/355F and line 4 baking sheets with baking paper. Take your dough disc out of the fridge and break into 3 sections. Take one section and place onto a sheet of baking paper on top of a board or your benchtop. Place another piece of baking paper on top of your dough and roll out with a rolling pin until about 1/2 cm/0.25" thick. Cut your cookie dough with cookie cutters, placing your cookies onto your prepared trays, leaving about 2cm of room around each cookie. Repeat until all of your dough is cut out and bake your cookies for 8-10 minutes or until lightly golden and firm on the edges. Allow to cool for 5 minutes or until firm enough to handle and then place onto a wire rack to cool completely. Once your cookies are completely cooled, decorate them as desired. We simply dipped ours into melted chocolate and sprinkled them with sprinkles, then placed them into the fridge to harden. These cookies are best eaten on the day they're made but will keep for 2-3 days or can be frozen either as dough to bake later or as baked and decorated cookies. *You want to use full fat brick style cream cheese here, not spreadable or light cream cheese. And what are your Easter plans for this year?